Traditional shaves given by barbers seem to be a thing of the past. Many men would much rather shave then go for a straight razor shave it seems. 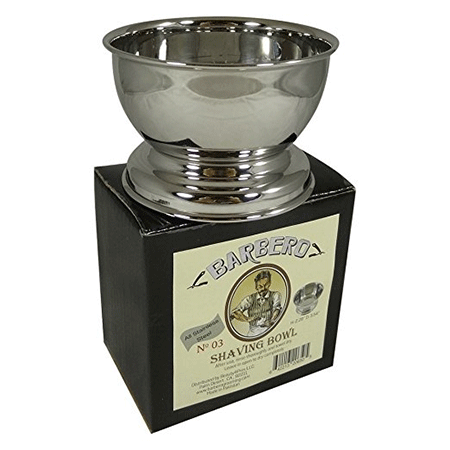 However, the shave soap bowls that used to hold the wet shaving cream are still popular items. Not only are these shave bowls mean to mix up a full lather of shaving cream, but it can also be used as a dampening dish to hold onto that cream without making a mess. 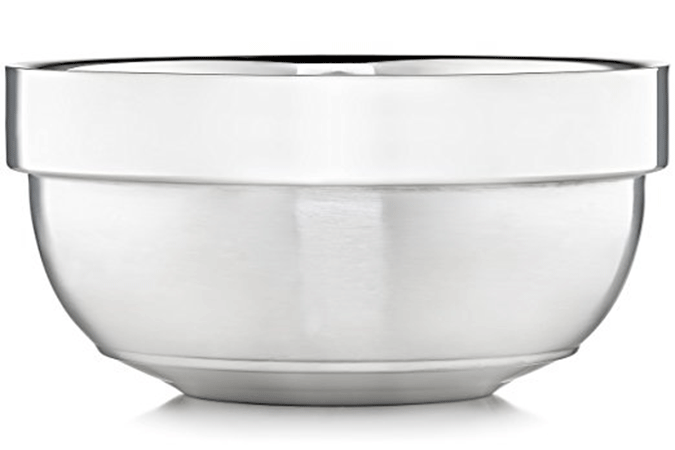 High-quality stainless steel makes Barbero’s bowl. According to tradition, this bowl is made by hand and polished to a perfect shine and easy to clean surface. It measures 3.5 inches in diameter, and it is only 2.28 inches tall. 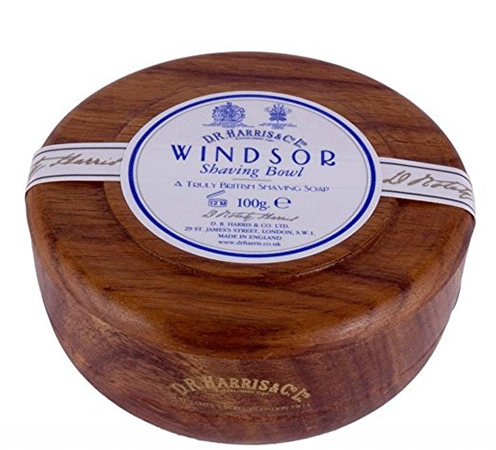 This shaving bowl is small in size, but it is wide enough at the top to hold plenty of lather. At the same time, it does not have a handle attachment. Rather, the neck connecting the base of the bowl to the bowl itself is shaped to be held firmly in hand. The total weight of this bowl is only about 4.8 ounces, so it is light to hold, despite being made out of stainless steel. 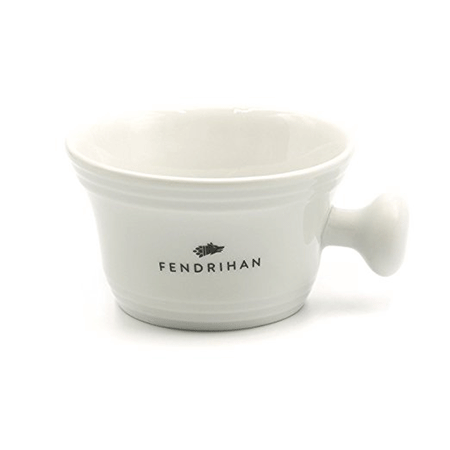 Fendrihan’s porcelain ceramic soap bowl is made in Europe under the watchful eye of artisans. The design is simple in appearance, which makes it also sit as a nice decoration in any bathroom when not in use. Instead of being attached to a base, this soap bowl comes with a handle carved right into the bowl’s side. To provide the right shape, this bowl also presents with a wide mouth, leaving plenty of room for users to access their slathered creams and soaps. Furthermore, this bowl offers a large size, which dimensions are as follows: the base measures 2.5 inches in diameter, and the top measures 4.3 inches in diameter. Anself’s wooden shave bowl works for shaving cream or cleaning soap. Hence, its purposes include shaving and cleaning beards and facial hair. This bowl comprises of fine textures both inside and outside for a delicate appearance. At the same time, this bowl stands up to harsh treatments. Due to its porous nature, it should be cleaned out thoroughly after each use. However, the wood possesses abilities for corrosion resistance, so it should stand up to long periods of use. 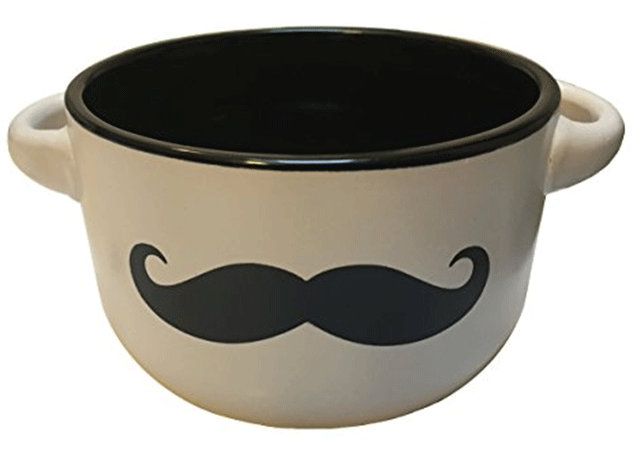 This shaving mug comes with a decoration meant for a bit of humor. On the side, a big, bicycle-handle mustache sits with a smile facing the world. 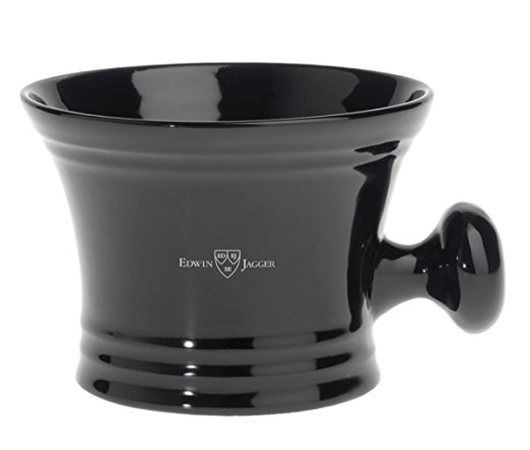 Unlike typical shaving mug models, this one sports two handles: one on each side. These handles are not large enough for a finger to slip down and around it, but they do provide ample room to grasp the mug firmly. It features ceramic materials, which means it is easy to clean after each use. Such ceramic is not porous, and the wide opening gives ample access to plenty of cream and soap. 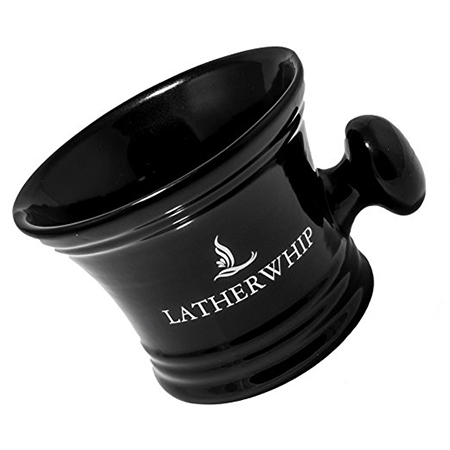 With Latherwhip’s shave bowl, people have plenty of room to whip up ample amounts of lather. Due to the ceramic materials used to create this bowl, it will also maintain temperature for longer periods of time. Unlike other models mentioned thus far, a whipping lather brush comes with the bowl. This brush’s design fits perfectly into the bowl, and the two works together for the right lather consistency. Henry Cavendish’s model is similar to the Latherwhip model. They are both made from high-quality ceramic, and the handle placement is the same. However, this model is wider in the mouth and a little bit narrower at the base. Such an arrangement creates tighter, denser lather. Mahogany wood comprises the materials for this Windsor mug. To create the perfect shape, hand-turning techniques focused the creation of this mug. Hence, production lines create this mug specifically for D. R. Harris. Due to the mahogany construction, durability comes as no surprise to most users. It will hold upwards of 100 grams of lather. While D. R. Harris provides soap in the mug, replacement soap purchases can also be made. Justice goes back to the stainless steel model for their bowl. This mug does not have any handles or grips at the base, but it will sit firmly in hand. 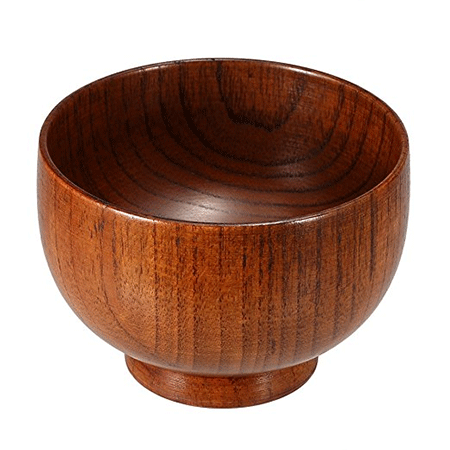 Materials used in construction for this bowl come with high-quality standards attached. Furthermore, the mouth of this bowl presents as extra wide, making it perfect to use for more than one session. Edwin Jagger once more goes back to a design similar to Latherwhip. However, this model is a little bit more narrow and taller. Therefore, the design gears toward use with hard shaving soaps. Though, it does not come with a brush that complements the bowl’s design. Once more, this model uses stainless steel as the focal material. The design is attractive as the metal has a highly polished shine. Stainless steel also presents an ease of cleanup and durability that will last for years to come.